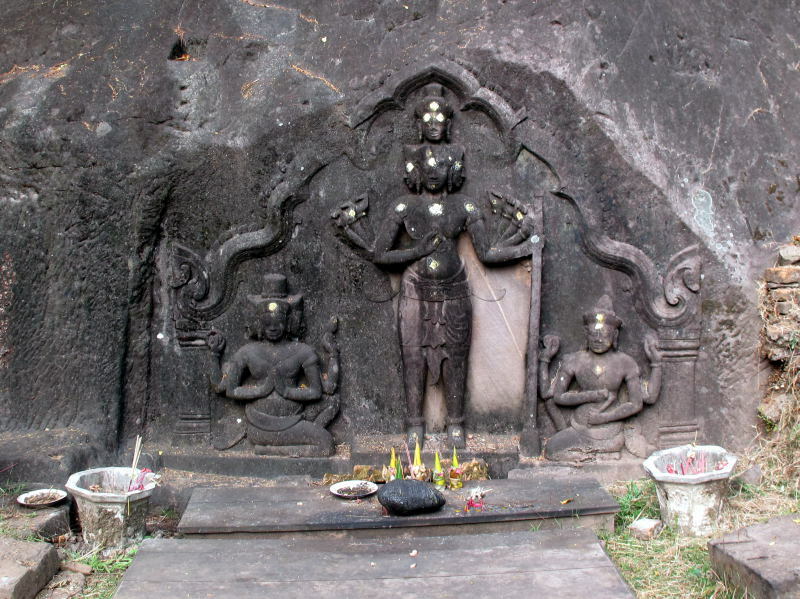 Vat Phou (or Wat Phou) sits hard up against a mountainside, facing east to the Mekong River. The site has been sacred for more than 1,500 years, but the current temple dates from the eleventh century, when the area was part of the Khmer empire centered around Angkor Wat. The mountain became important thanks to the phallic rock formation at its peak. 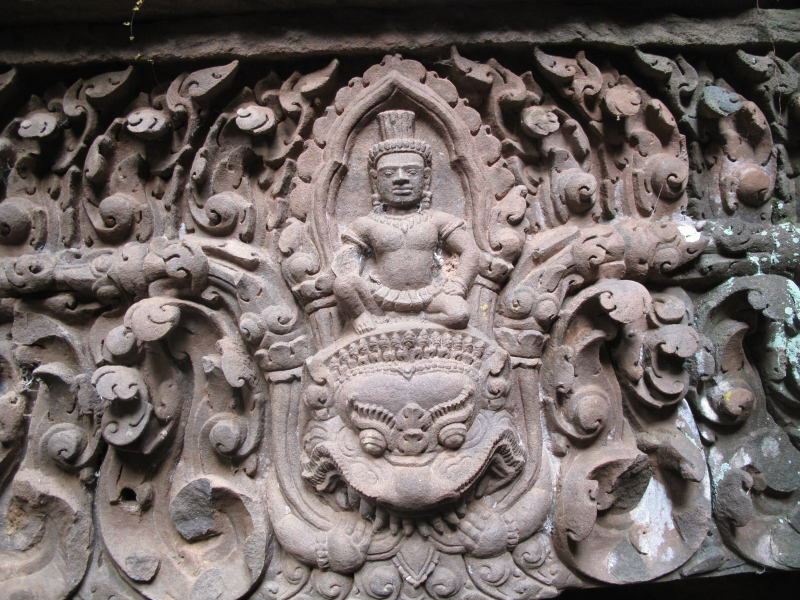 The phallus, or linga, is a symbol of Shiva, so the original Khmer temple was devoted to Him. It was converted to a Buddhist temple some time later. It was inscribed as a World Heritage Site in 2001. You enter the temple's large compound from the east, where the first thing you'll see are two large reservoirs, called barays. Beyond these two lakes are two more smaller rectangular ponds, which are usually dry. Between these two ponds is a causeway along which you can approach the temple. The first structures you'll see beyond the pools are two large buildings placed symmetrically on either side of the central walkway. They're generally referred to as the 'North Palace' and 'South Palace' although there's no evidence to support they served any royal purpose. The buildings are almost square, with large courtyards in their centers. The palaces were closed for renovation as of December 2011. Just beyond the South Palace is the much smaller Nandin temple, which was just completing restoration when I visited in December 2011. Beyond the lower group of buildings are a sequence of stairways connecting terraces worked into the hillside. The terraces appear to have once had structures on them, but there are few traces of them now. On the top-most terrace is the central sanctuary. The decoration of the sanctuary is still in good shape - some of it is restoration work - and you can see a lot of nice details up-close on the corners and lintels of the low doorways. The sanctuary is in two parts, apparently built many years apart. The front portion, which is still in use as a Buddhist chapel, is made of stone, while the rear portion is brick. The rear portion is closed off and unused. The four large Buddha images are rather in-elegant. Behind the central sanctuary is the almost sheer wall of a cliff. There are some carvings on some of the boulders, as well as some small modern shrines withing some of the larger cracks of the cliff face. One of these also seems to have a spring, where water is collected for use around the temple. Admission to the temple complex is 40,000 Kip (4.80 USD). The temple is open every day from 8:00 am to 6:00 pm. There's a special 'full moon party' event monthly on the night of the full moon during the high season from November to March, and an annual festival every February. 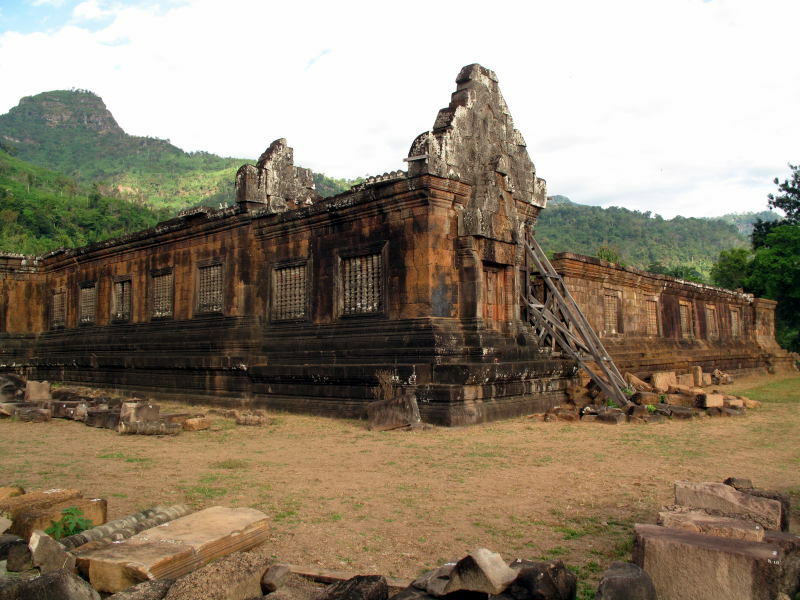 See the Getting There page for suggestions on how to get to Vat Phou.